I started reading this book called “The Elephant in the Playroom”. It is about the experiences of parents with special needs kids. Some of it is funny and some of it is heartbreaking, but all of it is encouraging. I find it so helpful to read stuff written by other parents with children who are “special”. Parenting a child who is “different” is just not the same as it is to parent a child who is “normal”. I have both types of kids and I can tell you there is a difference. It is WAY more challenging to parent a child with special needs. People seem to always equate a child’s behavior with a parent’s ability to be a good parent. With special needs kids, a lot of the time, you can try the same parenting tricks that worked on your “normal” kids and those things do nothing for a special needs kid. You feel like you are a rookie parent and know nothing. And you feel like a failure as a parent sometimes because no matter how hard you try you cannot make your child behave. For example, Joshua has issues with impulsivity. He has recently been diagnosed with ADHD and that comes with the territory. The pediatrician explained to me that even if Joshua wants to behave his impulsivity will take over and he physically cannot keep himself from doing that thing you just said not to do. With typical children if you say “no” and punish them enough times, you usually get through on most things, but not a child with impulsivity issues. I tell him at least once a day not to turn on the water hose outside, and every day he does. It drives me nuts! But hearing that other families go through the same things with their children makes me feel better. I am not a bad parent because my child misbehaves, he has challenges that have nothing to do with me. Friday was a rough day. I was on my way to a developmental pediatrician appointment and the traffic was horrible. It took me an hour and 20 minutes when it should have taken me 30 min to get to the appointment. Needless to say I was late. Very late. At one point I called the doctor’s office to tell them of my situation and the receptionist said I had 10 minutes to get there. I told her that was impossible and she said to hold for a minute. During the time I was on hold, I lost it. I was sure they were not going to let me see the doctor that day because I was so late. I NEEDED to see the doctor. I needed him to tell me what to do. Most of the time I feel at a loss for knowing what in the world I should do to get through to Joshua. I was literally sobbing on the phone with the poor receptionist when she told me I could see the doctor when I got there. The doctor was very helpful and told me I was doing all I could. Going to the developmental pediatrician is much like going to a pep talk for me. I tell him all my issues and he gives suggestions and tells me I am doing a good job and it’s not my fault if my son does crazy stuff. It’s a very different experience than a normal pediatrician appointment, but when you have special needs kids it’s what you need. It’s like a therapy session. When I left there it was past lunchtime and Joshua had only had a snack and I had nothing. We had to stop at the pharmacy on the way to pick up my other son from Grandma’s. We got there and they didn’t have the medication I needed, they said I would have to come in so they could call around to other pharmacies to find it. So, because I really needed this medication that day, I had to do it. I walked in with Joshua knowing this was not going to go well. Joshua started wanting to run around the store, so I had him by his hands and he is screaming and writhing around like a wild animal. People stared starring. I knew they were and I have gotten pretty good at ignoring them, but on this day I was trapped there and they were so openly giving me looks that said, “do something with that kid”, and ” if you were a better parent he would act better”. I finally picked Joshua up cradled him like a baby and started swaying with him. This worked, thank goodness, but then it became obvious to people that he was not an ordinary kid. It was then that they asked if he was okay and I said “yes” and they gave me the pity look. I hate that look. I am not sure which is worse, disapproval or pity. Finally, they found my meds and we could leave. I felt alone. I felt sad. I felt angry. In reading this book I have realized that in having a child with special needs there are stages you go through. They are the five stages of grief. They are denial, anger, bargaining, depression and acceptance. I realized that this is not an overnight thing. It can take years to go through these stages and get to acceptance of who your child is. Right now I will admit, I am in the anger stage. I am angry at the situation and the causes for his issues. But I am so glad to know I will get to acceptance someday, if I just keep on keeping on. 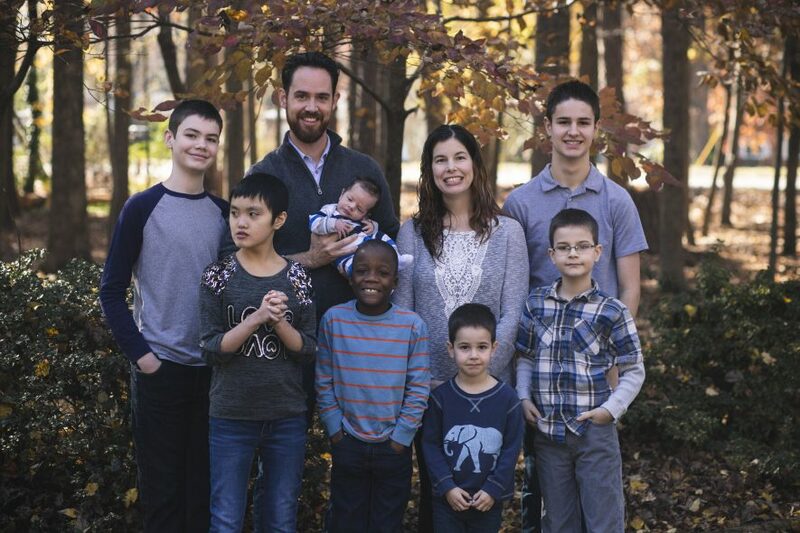 I know that it might be shocking for some of you to hear we have struggles with our son and accepting his special needs and here we are adopting another child with special needs. People love to say to me, “how are you going to do that?”, and “why would you do that?”. I have to simply say that, first God led us to this and HE will supply all our needs in Christ Jesus, and that is not just physical needs, but emotional ones as well. And second, it is not all difficult, there are precious moments with our son everyday. I want to be honest though, because I feel like too many people paint rosy pictures of adoption and special needs and it’s just not rosy all the time. Nothing is. It is hard. Parenting Joshua is one of the hardest things I have done. But it is worth it. It makes me appreciate small things, like him hugging me, which is a recent developement. It gives you perspective. And everything God calls us to is not easy, in fact most of it is not. But there are rewards, both in this life and in heaven. And that is what I push toward. I want to be honest about our experiences so that others can see what it is really like and so others who are going through it will not feel so alone. Wow. I need to get Jeremy to read this one. Our situation with Todd is nothing like your with Joshua but the feelings are still the same. Thanks for being open. Ruth, you are an amazing mom! God’s provisions are great! This special little boy is blessed to have you and one day you will see the fruit of your labor, commitment & sacrifices in the man he becomes! Keep on holding on!